One skein of really gorgeous handspun merino from Green Apple Yarn (colour: Peacock Plume) -- thanks again, Pam! 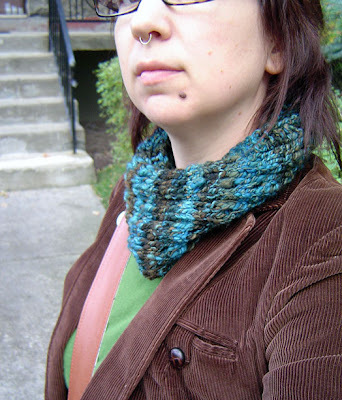 -- plus a free pattern called Quickie Cowl by f. pea and a 6.5mm needle. Tricky to photograph. I may have gotten a little frustrated trying to get a good shot, actually. Too bad Halloween was last week, eh?! That yarn is magically delicious, especially knitted up like that. I'm tots for jeal. You could rob a bank with that accessory. 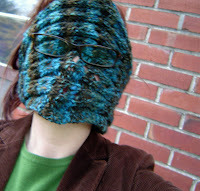 Hey, it matches the garter mitts in your banner! I love it! And that is a gorgeous colour. Looks like the Great White North is cooling down. It's a very chilly 23C here today. Not very summery at all!